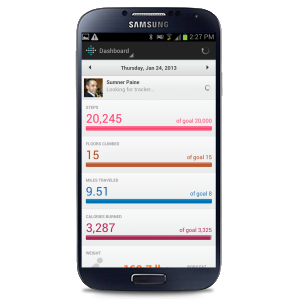 Fitness technology is now infiltrating the smartphone business, with Fitbit announcing that they are now integrated into the Samsung Galaxy S4. This demonstrates the growing demand for pieces of fitness technology which can help us get fitter, faster, and Fitbit has been at the very top of the fit tech business for some time now. Fitbit is a fitness bracelet which tracks your daily movements in order to help you measure, and ultimately improve your fitness. Activity trackers are the pedometer of 2013 but with the addition of applications which pull in the data in order to provide actionable insight for the user. This app sits on your iOS or Android smartphone, enabling you to collate data and uncover insights. The challenge for Fitbit has been Android phones thus far, with bespoke integrations required to make it work on each phone model. Naturally there has been strong market demand for the popular fitness tech brand to integrate into the Galaxy S4, a phone which has grown a big fan base in a short space of time. Fitbit have updated their tech to integrate Bluetooth 4.0, and that does open up some much more interesting opportunities for Fitbit. Integrating Bluetooth 4.0 does not fix the problem for Fitbit though, as they still need to provide custom support for new models, even if the model carries Bluetooth 4.0. The problem is not the hardware, as in the Bluetooth, but the phones unique software. Fitbit requires specific software within the phone to allow it to ‘talk’ with the hardware component.